It’s either a fear or a flow of excitement for a new yoga teacher to be taught adjustments. The often-incorporated step into yoga teacher training’s that teachers are encouraged (with little to no anatomy training) to move a student’s body around with little to no knowledge of their circumstances and limitations. I have seen a lot evolve over the years as a yoga teacher. And a lot has changed in fifteen years of teaching. One thing that has drastically changed for me is my involvement with my students on the mat while I teach yoga. I will admit in my earlier years in teaching, I taught a great class, very soulful, inventive but I was naive. I knew very little about the body and about: how the body moves, should move, and doesn’t move. I was taught parts and poses, I was not taught people. So, to fulfil my yoga teacher training requirements, I learned adjustments. Moving a person’s foot here, guiding their knee there, trying to gracefully fight against their tight hips to create an experience of “openness” to the level I thought it should be, all based on poses and parts. By the grace of God, my teaching style has evolved and so has my level of education. I, now, have come to a place as a yoga and movement guide to truly believe that it is not OK to physically touch, adjust, or maneuver a person’s body no matter how much you think you know, during a yoga class. Think about it, every other person that “adjusts”, “manipulates” or “presses and pulls” on people HAS A LICENSE! All need state approved licenses to touch their clients. Yoga teachers do not. And although yoga has a way of making one feel God-like, reality is, they are not. Because yes, yes you can get hurt in yoga. And if by chance someone does, as a yoga teacher, it is best it not be by your hand. If you are a yoga teacher one thing you can always ask yourself is: “why do I feel the need to make the adjustment”? Verbally instruct and demo with clear instruction what the student should be doing. Verbally specify what the group of students should focus on and point it out on your own body (and possibly ask the entire group to watch). Verbally instruct & direct 1:1, meaning, go over to the student and from behind verbally guide them and use markers to help them guide their own body where it may need to go towards. I know that during my years of teachings, some of my teachers were disappointed in my later training’s that I did not teach many “hands-on” adjustments, and the immediate need to go out and learn them was very apparent with some of my student teachers, sadly without even having any teaching experience under their belt, perfecting the above. I have spent more than half my life interacting with people solely on a yoga mat and one thing I have learned is less is more. And when you adapt this to your class, what ends up happening is you facilitate your students to be self-responsible. You request that they cultivate a sense of self awareness, in that I could move your knee out to the side 100 times and you will still never remember to do it. But if I request your awareness of the maneuver and give you a valuable reason why to explore this and ask you to do it yourself. You will more than likely do it one or two times and remember forever, which may just be another benefit of practicing yoga in a more hands-off way. I will admit, in my earlier years I had a deep sense of ego-driven pride, when I would deeply move a students’ body and they would respond in “wow” and amazement of the release or challenge I brought to their practice. To those people I pray I never hurt you or manipulated your tissues in a way that caused later issue as if your body wasn’t willing to go there on its own, I should not have brought it there. Naive to a great deal of the legalities to what goes into being a yoga teacher. My eyes were opened wide when I opened my own yoga studio, and then in running my own yoga teacher training. Still not on board? It is not uncommon for yoga teachers to not even invest in liability insurance to cover the act of teaching yoga. And if you have liability insurance ask your provider if they specifically cover injuries inflicted by the you the yoga teacher. You may be surprised, they do not. 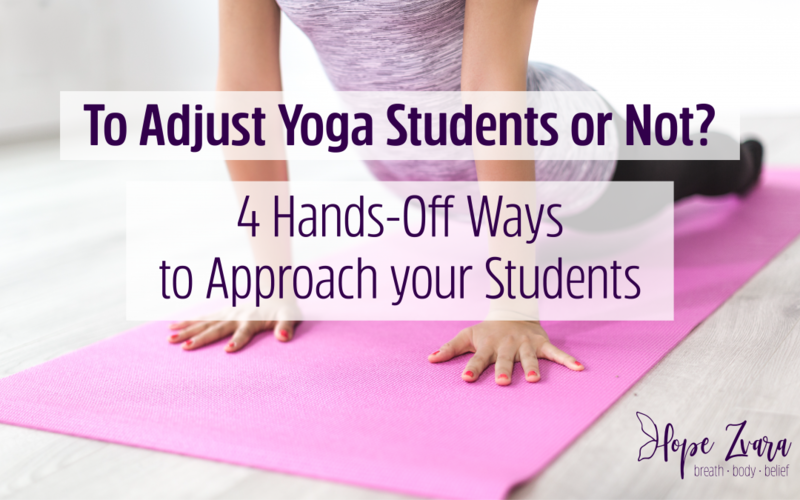 The good news: Take a load off, yoga teachers! Take a load off in that you are not responsible for your students’ bodies in a sense that THEY are responsible for themselves, something I think we all often forget about in today’s world. On a certain level, we are responsible for ourselves (a little yoga philosophy may help enhance this point). and energetically, one must be ready for change, because if the body is holding on, there must be a reason and while instructing a dozen others in a group setting is not really the place to figure that out. So, am I saying yoga needs to be state regulated? Not necessarily, but what I am suggesting is that all yoga teachers step back and reflect and ask is it necessary? Is there a better, safer way to help your students? And if the answer is no, then maybe that student should consider a different style of class, a private class or complimentary therapies like massage, chiropractic’s or physical therapy to help that issue resolve itself. Because what if giving a little less, will actually, in the end give more? Want to take a class with me? Check out my Asana Video Library.